OTTAWA, June 20, 2017 – The former United States embassy building in Ottawa is not a culturally appropriate space for an Indigenous Centre, says the Indigenous Task Force of the Royal Architectural Institute of Canada (RAIC), on the eve of National Aboriginal Day. “Indigenous people always get the hand-me-downs, the buildings, and land that settlers no longer have a use for,” says the task force, composed of about 30 mostly Indigenous architects, architectural students, interns and academics. “Canada's Indigenous communities have, for too long, been forced into leftover spaces that fail to connect in any meaningful way to their cultures and unique connectivity to place. Media outlets have reported that the federal government plans to announce in June that the former embassy will become a space dedicated to Inuit, Métis and First Nations communities. National Aboriginal Day is celebrated on June 21. “Once again, a lack of consultation precedes the decision,”says task force chair Dr. Patrick Stewart, of the Nisga’a Nation. The heritage building at 100 Wellington Street, located directly across the street from Parliament Hill, has sat empty for 18 years. Classical revival is perhaps the architectural style most identified with colonization. This building, which references Washington architecture, is a building of formal rooms, offices, and hierarchies, echoing structures of European authority. “It is not the first choice of Canada's First People,”says the task force. However, if the federal government moves forward with this idea, the task force says the site, with vacant land on both sides, offers an opportunity to either build a new purpose-built structure or repurpose the existing building. “In consultation with Indigenous Elders, knowledge holders, community members, and Indigenous architects, the opportunity now lies in how the site and building can be reconfigured, considering all options, to provide a welcoming space of immense pride for all of Canada's Indigenous peoples,”says the task force. “Perhaps the place to start would be for the federal government to provide capital dollars for the design and construction of a meaningful culturally appropriate structure based upon Indigenous knowledge through the use of Indigenous architects,”says Stewart. To be clear, this is only one option, says the task force. The use of this site should not interfere with a vision by Indigenous people to establish a centre at the islands in the Ottawa River between Ontario and Quebec. Dr. David Fortin, (Métis) MRAIC, Assistant Professor and incoming Director of the McEwen School of Architecture at Laurentian University. The purpose is to foster and promote Indigenous architecture and design in Canada and to advocate alongside Indigenous communities. 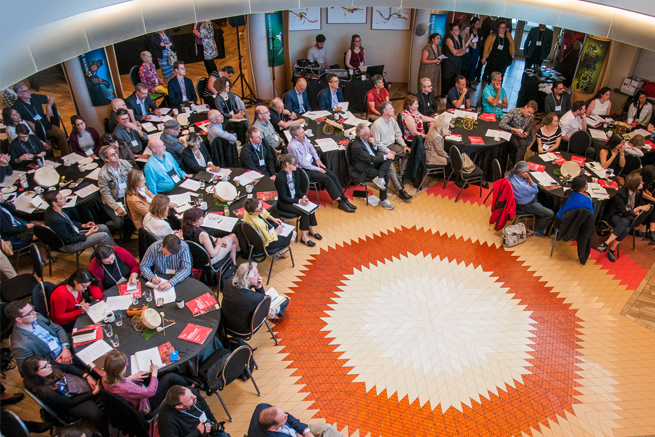 Task force members believe that architecture is a public-spirited profession with an important role in reconciliation –addressing injustices through giving agency back to Indigenous people.